The silk is finished, skeined and set - and about bloomin' time too. I have to say, I came to loathe spinning this. I read that tussah roving will behave like wool, and will do what you want it to do. They fibbed, I tell you! Jeez, this stuff just kept wanting to get finer and finer, and did the whole fibre sticking thing too. Silk does clump, especially after dyeing, so I seperated the rovings into thin sections but probably not sufficiently to make for an easy life. Looking at it here, all the imperfections I want to moan about aren't visible - typical. Infact, it looks pretty good. But I do assure you that it is an uneven spin, even the plying, and it's pretty lumpy and bumpy. It's also yielded an impressive yardage for it's 100gms, so it took an eon. Forever. Day after day of cursing at it. 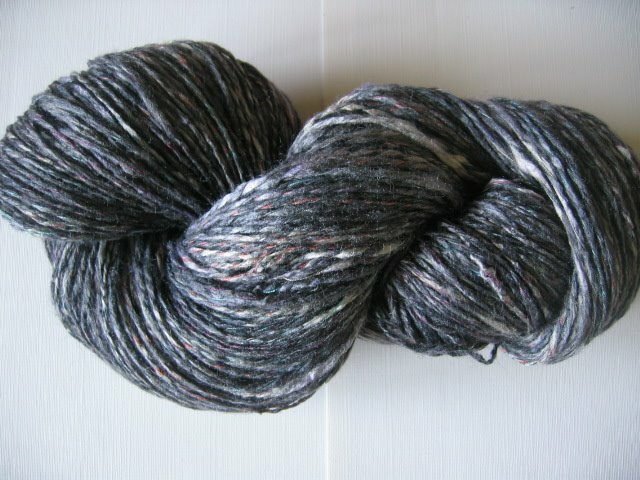 Plying in the ultra fine silk that I space dyed as an accent has worked and given it subtle colour reflections, although you can't see it in the photographs. When wool behaves like this, you can forgive it... it allows the imperfections and lumpy bits to somehow become a natural characteristic. Wool is more playful. But when you look at this skein of silk as a whole closely, it looks poorly spun and messy - which it is. More than likely due to my skills not being up to scratch. Possibly also due to my impatience, and possibly the fact that the spinning drill isn't the right piece of kit for working such a fibre. I won't say I'll never spin silk again, but I think I'll stick to wool and the like. Now some playful spinning is needed, something fun and quick to get me back into creative mode after the stiffling ways of the silk. I was all set to start on the orange Shetland, but even that feels restrictive and isn't inspiring me. Tom revealed the other day that he does intend making me a wheel in HitchHiker stylee. He's even started saving pieces of suitable wood and ply as he finds them. Bless. I have enough in my savings account to buy one and impatience is getting the better of me... yet I'd sooner have an original made by my man, so shall wait. Now something spinning related that should be shouted about. I stumbled across a Yahoo spinning group that deals purely with the trade of animal fibres between breeder/farmer and spinner/felter. It's a no chat group and they trade only in raw fibres - no scoured fleeces or commercial rovings are allowed. It seems a bloomin good idea to me. Cut out the middle man and allow the farmers and breeders to get a realistic price for their fibres. The spinner gets the pleasure of working those fibres from scratch through the whole process, and gets to know which animal it's come from. A much more organic, ethical way which appeals. At the moment, most of the farmers are from the US and I'm sure they'll ship overseas. But I would like to see many more UK farmers on there, so if you know any that could benefit, tell them about it. I emailed the details to a few spinners I know whom I thought could benefit, so if I missed anyone, check it out. Details found at the homepage - FleeceForSale. Over and out. Don't over do it on the chocolate.